Norfolk, Nebraska (Population 24,434), located in Northeast Nebraska. 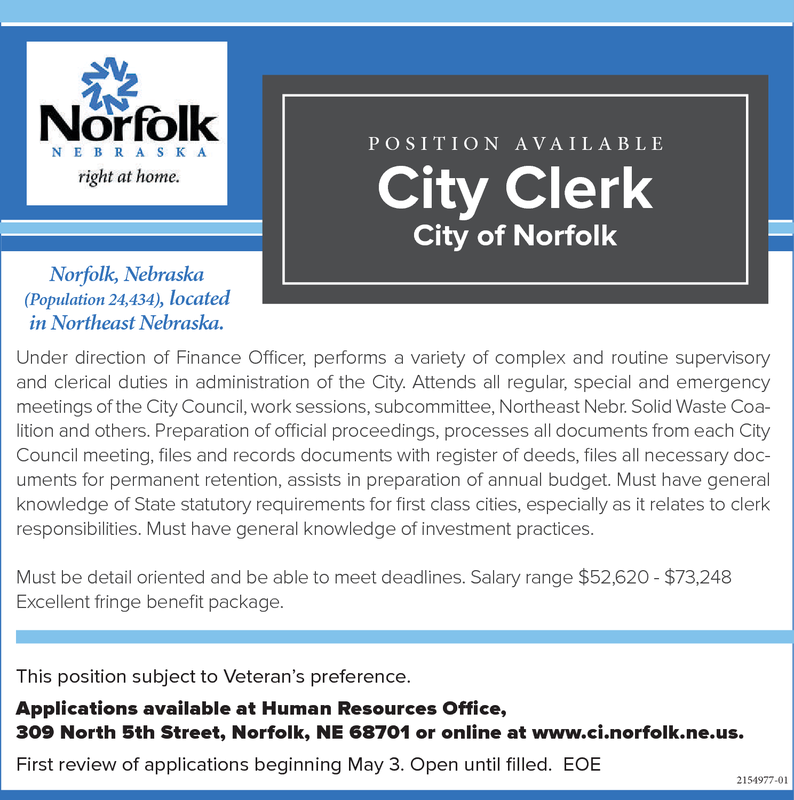 Under direction of Finance Officer, performs a variety of complex and routine supervisory and clerical duties in administration of the City. Attends all regular, special and emergency meetings of the City Council, work sessions, subcommittee, Northeast Nebr. SolidWaste Coalition and others. Preparation of official proceedings, processes all documents from each City Council meeting, files and records documents with register of deeds, files all necessary documents for permanent retention, assists in preparation of annual budget. Must have general knowledge of State statutory requirements for first class cities, especially as it relates to clerk responsibilities. Must have general knowledge of investment practices. Must be detail oriented and be able to meet deadlines. Salary range $52,620 - $73,248 Excellent fringe benefit package. This position subject to Veteran's preference. 309 North 5th Street, Norfolk, NE 68701 or online at www.ci.norfolk.ne.us.